For our 2017 Summer Competition we are holding a Sunflower contest, we are looking for 2 winners who have the tallest Sunflower by the 29th September 2017 and also the funniest photograph with their Sunflower. So you are wondering how to get involved? All you need to do is send us your name and address to either our Facebook page, Twitter page or info@retherm.co.uk. Once we have received these details we will send you a pack of seeds that you can plant in your garden or greenhouse. Once you have started to grow your Sunflowers why not send us some progression photos over the next couple of months. The image below is a small guide on how to grow your Sunflowers, however if you have your own method you are able to use that instead. On 29th September 2017 we will ask everyone who received our Sunflower seeds to send us a photo of their Sunflower with the correct height (no cheating) and also the funniest photo you are able to capture with your Sunflower whether it is of you, a friend or a family member. We will draw 2 winners on 2nd October with a prize for the tallest Sunflower and the funniest photograph. Our prizes will be a small gardening hampers which will include a bottle of wine and a variety of gardening items. These items can be changed to suit children if needed. What are you waiting for? Get in touch today and request your Sunflower seeds before they are all gone! Celebrating 25 years of Wind Power! Celebrating 25 years of wind power in the United Kingdom! Delabore Wind Farm in North Cornwall was the 1st commercial wind farm in the United Kingdom and back on December 21st 2016 it turned 25! That's a quarter of a century! On 21st December 25 years ago Peter Edwards switched on the wind farm and then in 2002 Good Energy brought the wind farm from the Edwards family. In 2010. Good Energy invested in replacing 10 small wind turbines for 4 larger, powerful ones. This increased the capacity of the site to 9.2MW. To the date of it 25th birthday, Delabore Wind Farm has created enough power to boil 3.4 Billion kettles. Now that is a lot of brews! Firstly, Welcome to the New Year 2017! A few weeks ago it was time for all of the team at Retherm to dig out their best Christmas jumpers and wear them with pride in aid of helping the Save The Children Charity. We had a range of jumpers on the day from Reindeer's to Minions to how to cook a Christmas Dinner jumper from our engineer Karl! We had some amazing comments from our followers on Facebook, what do you think about our Christmas Jumpers? Well join us in December 2017 for another wonderful Christmas Jumper Day to help the Save The Children charity! from all the team at Retherm! Retherm helps to save the environment! Throughout the month of October we have been helping to save the environment by giving a treat to every one of our customers who have an installation this month. Our customers are able to plant this tree where they wish to help to save the environment. These trees will then grow and attract wildlife of different kinds from butterflies to squirrels. We have been offering different varieties of trees to our customers this month from Field Maples to Hawthorns, Rowan and Common Alders. Please see below to read more about these wonderful trees. A Field Maple is a common small tree that is often found in the woodland area. The field Maple is a great tree for wildlife as the small flowers that can be seen are a treat for bee's and insects. Also, the seeds from the tree are eaten by woodland mammals such as wood mice. In the autumn season the Field Maple leaves will clear yellow in color and sometimes flushed red as well. A Hawthorn is one of the most common trees which is mostly found in hedgerows and woodlands throughout Britain. They flower in the spring, where red berries are produced and contain the right nutrients for birds which makes them a good food source. A Rowan is a slender tree with silvery, brown bark , creamy-white flowers and autumn berries. These clusters of flowers are followed by the red autumn berries which can be used to make jelly that's if the birds don't beat you to them first. The alder tree is a native tree of Britain but can also be found throughout Europe as far as Siberia. These trees can usually be found around wet land such as marshes and stream sides. 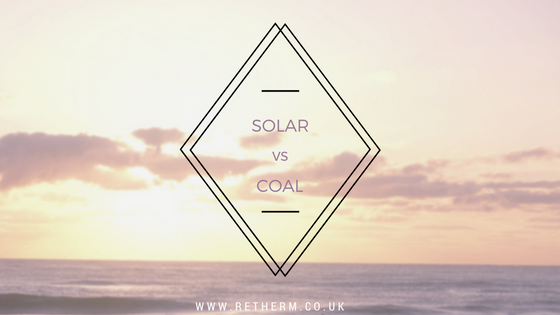 Over the past 6 months leading up to September 2016, Solar Panels have generated more electricity in the United Kingdom than coal. According to a new analysis, nearly 6,964 (5.4%) Gigawatt hours of electricity between April and September. That is 10% more than coal has generated which was 6,342 (4.7%) Gigawatt hours during the same period of time. It all started one day in April, when more electricity was produced by solar panels than by coal, this carried on into the month of May. With coal producing zero power for the 1st time in over 100 years. “This new data shows its popularity amongst homeowners and businesses and its falling costs. Now that we have a significant global and domestic industry, solar is one of the cheapest forms of power."